Sometimes it takes a crisis. Sometimes it takes a terrible tragedy to remind us what’s important. In a week of unremitting sadness for the victims of the earthquake in Haiti, it has been oddly refreshing to turn to United Methodist information sources and not read about our institutional plight, but instead about our missional reach of compassion and concern. We are able to set aside the lesser issues of our declining numbers and lack of funds to actually remember who we are — the body of Christ. There is a deep, heartfelt outpouring of compassion and love that indicates where our “treasure” truly is. When it matters most, we’re able to be the people God needs us to be. But why does it take a crisis? What is happening in Haiti is horrible… but the conditions in Haiti have been unjust, intolerable, and terrible for a long, long time. Where were we then? My deepest concern is that the same thing will happen here is what always happens — after the earthquake is no longer news, and Brittney Spears or Lindsey Lohan have their next meltdown — Haiti will be forgotten just when she needs us most. We can only cope with crisis so long, then we need relief ourselves. The Tsunami of 2004 and Katrina in 2005 are good evidence. We are still way far away from healing those two catastrophes, but we hardly hear about them anymore. Mission team after mission team return from Louisiana and Mississippi reporting that there are entire communities where rebuilding has yet to begin. But these tragedies are “old news.” In this time of “new” crisis we are ready, willing, and able to respond. 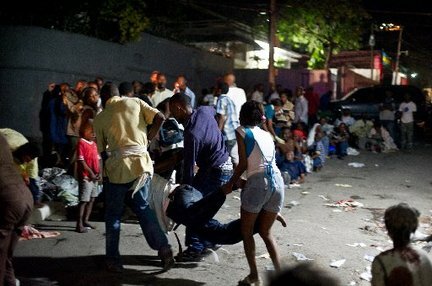 But the estimates in Haiti are that between 1 and 2 million are homeless and hungry (due to the quake) and that 250,000 to 450,000 are in at-risk, urgent-need situations. Army Corps of Engineer estimates for rebuilding are 36-to-72 months for major structures; 48-108 months for residential areas. Three to nine years just to get back to substandard, low poverty-level, bare-necessity living! It boggles the mind. 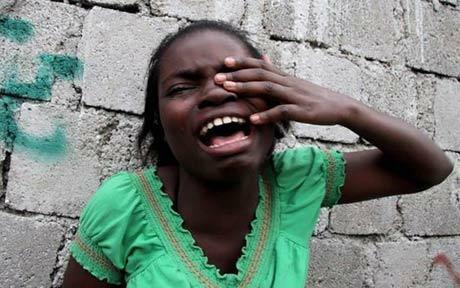 Here is my prayer: we adopt Haiti. Not in a paternalistic, patronizing way, but as a concerned family doing everything in its power to get a loved one back on her feet. If The United Methodist Church in the United States — almost 8 million members strong — made a commitment to “bring Haiti back BETTER than before,” we could work a miracle. Think of it. If 8 million people would just commit $10 a year — less than a dollar a month, for crying out loud! — that would provide an $800,000,000 pool of resources to support the rebuilding efforts. That could make a huge impact. If we made Haiti a VIM (Volunteers in Mission) and local mission trip priority, we could provide human resources to make that $800 mil go a lot farther. We could get more people down to Haiti to meet — and fall in love with — the people. We could improve communications and become a deeply connectional church with some of the most needy people in the world. Of course, we could do this with anyone at any time… if we wanted to. Our General Board of Global Ministries does an outstanding job promoting, supporting, and empowering a global church. But there are a whole lot of us who don’t take advantage of the opportunity. In fact, many have no idea what our opportunities are. Many of our most charitable members and congregations have no idea all the work we do around the world, and all that needs to be done. Shame on us for not telling the story. Crisis helps us see what is possible. When we rise to meet an incredible challenge we come to understand that we’re not just capable of doing “good,” but by God’s grace we can do miracles. Our world needs miracles. Our world needs the grace of God. Our world needs us to be the church — to be the very body of Christ. And we need to be the body of Christ when it matters most — each and every second of each and every day. Thanks for the reminder, Dan, of our culture’s attention deficits–and more importantly, the possibilities. When we undo the yoke, a famous prophet said, then our light shall shine like the sun, then we will be known differently as the repairers of streets. Loving Hait might change us–not our primary reason–but a consequence of taking the focus off of self and entering into relationship as God does, with extravagance. By way of accountability, if we enter into real relationships, it should be deep enough to say no to the cultures of graft, to influence those who build hotels destined to fail, schools that will fall on children, etc. this sounds like a good idea. That’s a mission roject close to home. Of course we’re also pushing the African work as well so that may cut down on donations. I believe we’re talking 80 million dollars a year ather than 800 million.